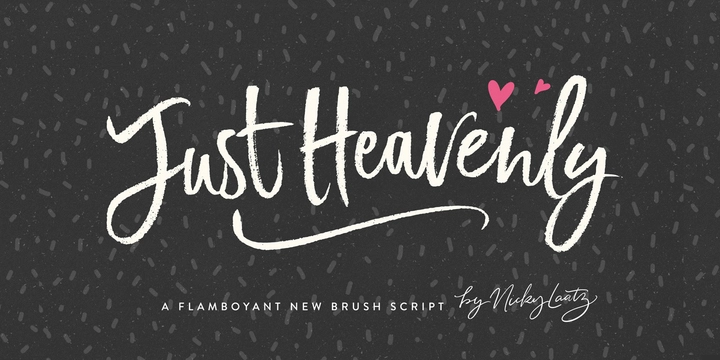 Just Heavenly is a brush script created & published by Nicky Laatz which is available in 2 styles (Regular & Dingbats). It contains a wide range of OpenType features such as Lowercase & uppercase characters, Lowercase /Uppercase alternates, Ligatures and Extra. Also it has 62 delightfully doodles dingbats. With a natural look is perfect for your projects, advertising, branding, greeting cards, invitations, posters, weddings etc. Have fun! A font description published on Monday, December 18th, 2017 in Fonts, Nicky Laatz by Alexandra that has 1,811 views.